If you have read my blog at all you know that I love to make breads. A couple of months ago I made my first scones, they were the blueberry ones. Most of my family loved them, so I decided that I had to make more scones. So I have been looking for a recipe for scones that would be appealing to my family. 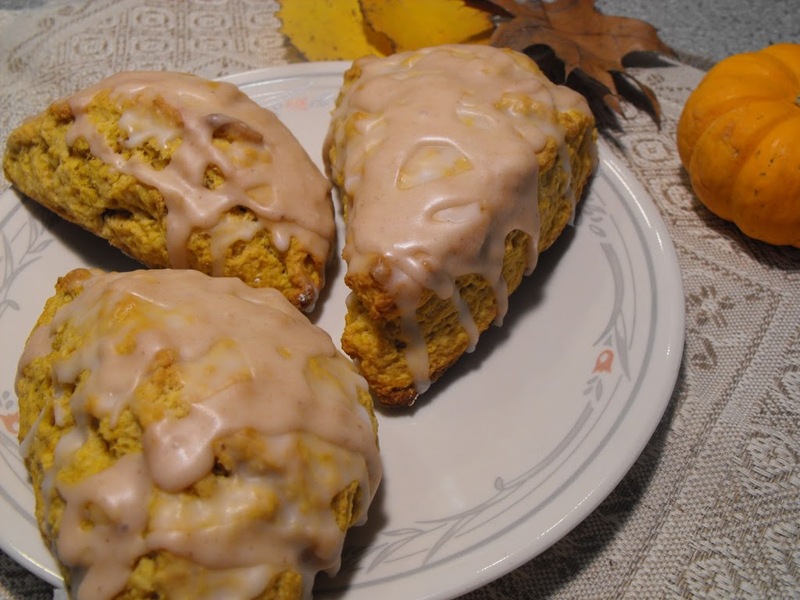 Most everyone in the family likes pumpkin and since it is the season for pumpkin and spices I have been looking for a pumpkin scone recipe. I went to our local library and have been paging through recipe books for a pumpkin scone. I never dreamed that it would be that difficult to find a pumpkin scone recipe in a recipe book. Who knew? Finally I decided that maybe the internet would be a better choice for finding that perfect recipe. 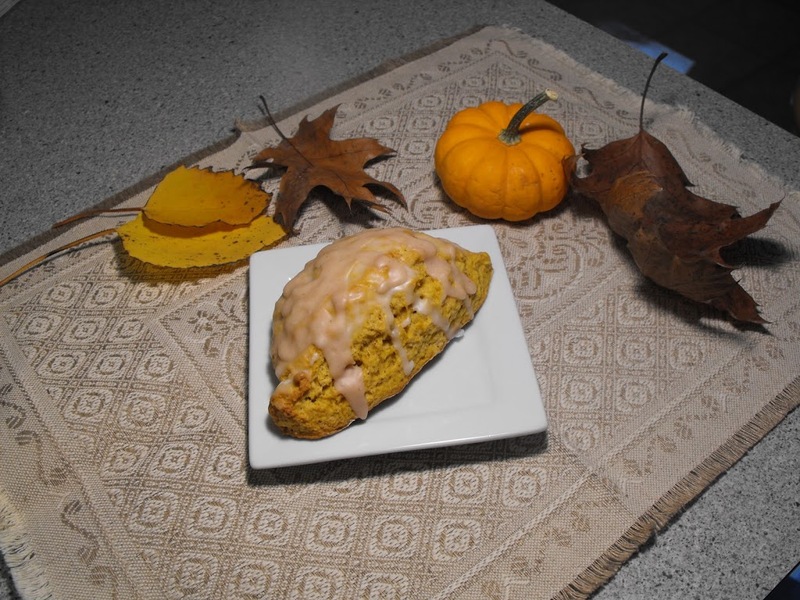 Guess what… I found the perfect pumpkin scone recipe. It was waiting for me at www. food.com. When I saw the recipe I knew that it had to be the one that I would make. Mike is one that doesn’t like scones too much, he thinks that they are a little on the dry side. Well the recipe that I found had icing on them, so I knew that this would make them a little more moist. Actually it has two kinds of icing so that was even better. 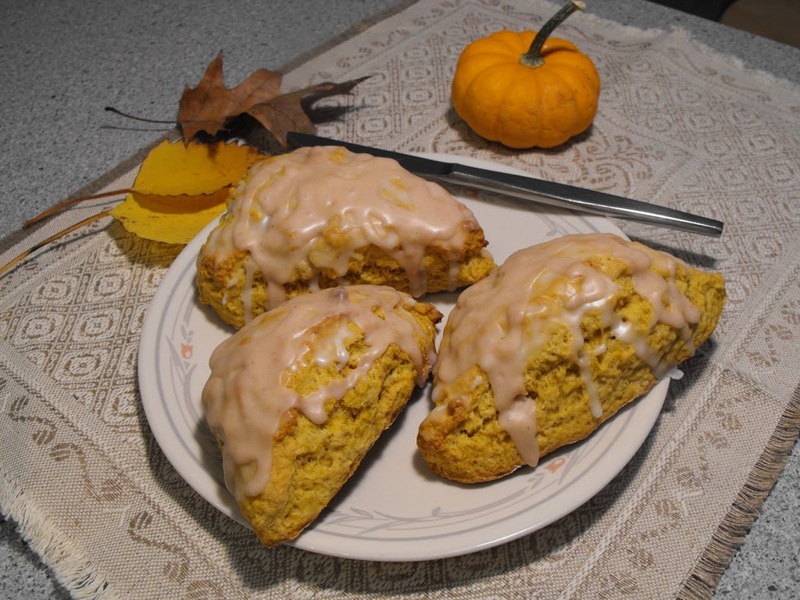 As these scones baked it sent the fragrance of pumpkin and cinnamon throughout the house. I couldn’t wait until they would cool so I could put the icing on them and have a taste. They were worth the wait; my family loved the flavor of these scones. The cinnamon, nutmeg, cloves and ginger paired quite nicely with the pumpkin. The cinnamon and the nutmeg in the icing topped off the scones perfectly. They were really quite simple to make. I hope you will give them a try. Pat our dough onto a lightly floured surface and form it into a 1-inch thick rectangle (about 9 inches long and 3 inches wide). Use a large knife or a pizza cutter to slice the dough twice through the width, making three equal portions. Cut those three slices diagonally so that you have 6 triangular slices of dough. Place on prepared baking sheet. Bake for 14 to 16 minutes. Scones should begin to turn a light brown. Place on wire rack to cool. Combine the ingredient for the spiced icing together. Drizzle this thicker icing over each scone and allow the icing to dry before serving (at least 1 hour). Wow – those look amazing! I love pumpkin anything. I could almost smell these baking as you were describing them! So scrumptious! I love when you see a recipe and you know right away you’re going to make it.